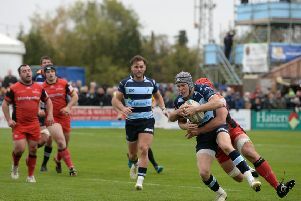 After a weekend off and the chance to revitalise, Bedford Blues will be looking forward to a first home game in three weeks as they welcome high flying London Scottish to Goldington Road on Saturday afternoon. Having started 2015 with vital wins over Moseley and Doncaster Knights, Bedford experienced their first loss of the year last time out at Rotherham Titans and will looking for some help from the Goldington Road faithful as they look to get one over on Mike Friday’s men. When the two teams met at the Richmond Athletic Ground back in September, the Blues just missed out on what would have been an incredible second half fight-back and left the capital with two well deserved bonus points. Looking ahead to the game, Blues Defence Coach Ian Vass said: “We’ve started the year in pretty good fashion and although we lost away at Rotherham, we were pleased with the way that the lads applied themselves after going 14 points down very early on to make a fight of it. Club captain Nick Fenton-Wells return from injury to take a place on the bench while Mike Le Bourgeois and Jake Sharp return in the backs. Tom Williams, Charlie Clare and James Currie come into the front row with Ben Gulliver taking a place in the second row. 2. Charlie Clare; 3. James Currie; 4. Harry Wells; 5. Ben Gulliver; 6. Paul Tupai; 7. Justin Blanchet; 8. Joe Vandermolen. Replacements: 16. TJ Harris; 17. Camilo Parilli-Ocampo; 18. Phil Boulton; 19. Mike Howard; 20. Nick Fenton-Wells; 21. Darryl Veenendaal; 22. Steffan Jones.